First Aid, CPR & AED – NY Fire Consultants Inc. This course will teach the student what to do in a cardiac emergency for adults and children 12 and up. Care for the choking victim both conscious and unconscious. It will teach the use of the automated external defibrillator (AED), which can save a victim’s life that is in cardiac arrest. The Class will instruct the student on proper techniques for certain medical emergencies such as hemorrhage control, fracture management and environmental emergencies. A written exam and skill testing is necessary for completion and certification. 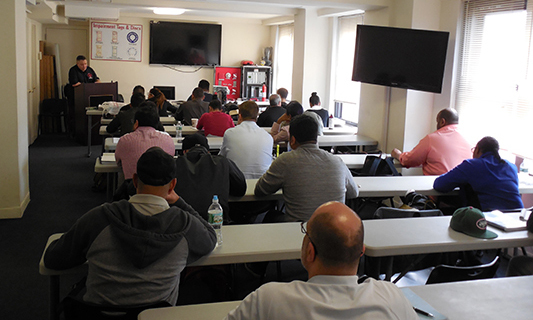 All classes are taught at the NY Fire Safety Institute (NYFSI) in midtown Manhattan. See below for directions. Check availability below. If no classes are currently scheduled and you would like to be added to our wait list, please send us an email and we will notify you once a class is scheduled. Please note that course price does not include cost of the card.